*** Only a single team is allowed per league for Majors, Intermediate, and Juniors. All All-Star opportunities are subject to evaluations as well as sufficient eligible players and coaches. For more information, refer to our All-Stars page. Rookies Division: The Rookies Division, with its emphasis on FUNdamentals, is our machine-pitch program designed for boys and girls aged 6 to 8. This program is a vital part of a player's transition from hitting the ball from a tee to hitting one pitched by an opponent. The Rookies Division program emphasizes fun and development over competition, but scores and standings are still kept. The Rookies practices will begin in mid-March, and the season ends mid-June. Generally there are 3 contacts per week. Early season it will be 3 practices. Then as games begin, games will replace some of the practices. There are no all stars for this division. Minors Division: Minors Division is a player-pitch league, and game scores and standings are kept. Many of the players get their first chance to pitch to live batters. The Minors Division is primarily for 9 to 10 year-olds. The competition is more intense than the Rookie league, but player development is still the main focus. Practices will begin mid-March with typically 4 contacts per week; the regular season ends mid-June. All star tryouts and selection will be mid-June. 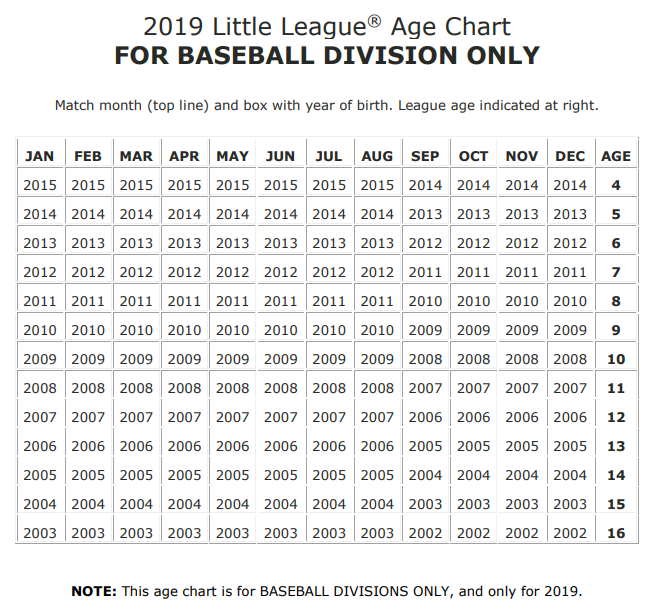 Majors Division: The Majors Division of Little League Baseball is for 11 and 12 year old players. It is played on a 60 foot diamond without base leadoffs. It is this division that you typically will see playing on television, in tournaments leading up to the Little League World Series. Practices will begin mid-March; the regular season ends mid-June. All star tryouts and selection will be mid-June. Intermediate Division: The Intermediate Division of Little League Baseball is a competitive program played on the 70 foot diamond which allows base leadoffs and big-barrel bats. Intermediate is a try-out only division, meaning not all players will be guaranteed a spot on an Intermediate team. Players not selected for Intermediate Division will placed on a Majors team (11 or 12 year olds) or a Juniors team (13 year olds). Practices will begin mid-March; the regular season ends mid-June. All star tryouts and selection will be mid-June. Formation of the Intermediate Division is pending having enough interested players sign up. Should there not be enough players to form the division, players will be placed in their age-specific alternative (Majors/Juniors). Intermediate Division is open only for players league aged 11-13 (younger/older players are not eligible). Juniors Division: Our Junior Division program is designed to be the transition to the 90-foot diamond for high school and beyond. This division plays baseball with very few modifications to Major League Baseball rules. Designed for 13 and 14 year-olds, this program provides greater competition from Little League, including travel to nearby communities. Practices will begin mid-March; the regular season ends mid-June. All star tryouts and selection will be mid-June. Players with Disabilities: Our district provides a wonderful program for physically disabled youth ages 7-21. Challenger Baseball is based in North Denver. Please email for more information. Playing Up: All divisions, with the exception of Intermediate, allow players to request to play in another division outside of their primary age group. All requests are subject to space in the program and player evaluations to demonstrate adequate skill and ability. Minimum Play Requirements: Coal Creek Little League mandates additional minimum play requirements on top of the Little League requirement.